RCC platform coping | Gurugram ,India from Surabh Ferro Concrete Pvt. Ltd.
Our Expertise in manufacturing SFRC Manhole Covers and Frames since 1992 has led us to become one of the largest manufacturers with the highest quality product in the industry. We manufacture all types of Drain Covers, Gully Gratings, Manhole Covers and Frames , as per our customer's requirement. 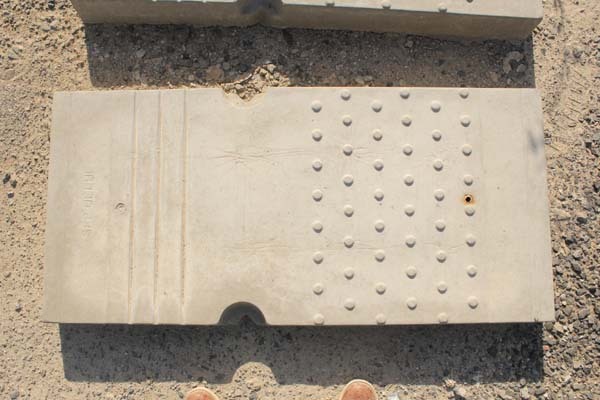 Precast concrete U drains allow for faster construction of channels with minimum wet cast concrete work. These drains range in widths from 200 mm to 855 mm. They are produced in strict factory controlled conditions that ensure high quality. Besides storm water drainage, these types of drains are also used to house underground cables and waterlines in industrial setup. Leveraging on our years of experience and in-depth knowledge of this domain, we are offering Railway Platform Coping Stone to our prestigious clients. These RCC platform copings are highly known among the clients for their dimensional accuracy, longer functional life and fine finishing. Our expert professionals have manufactured these platform coping in adherence with the industry laid standards &norms.Our platform copings not only add to the aesthetics of the platform but also incorporates a tactile surface to aid as warning for the visually impaired. RCC Prestressed Precast Boundary Wall. These offered walls are constructed using prime quality raw material that is sourced from the most valued vendors of the industry. Moreover, this range undergoes stringent quality checks as per industry defined standards and norms. In addition to this, clients can avail this range in various sizes, grades and dimensions as per their tastes and preferences. We are pioneers in manufacturing Concrete Interlocking Paver Blocks. Our product has been used at majorly all the Petrol Pump/Station Sites in Delhi & NCR, Punjab, J&K, etc covering a major part of North India. We are considered among the masters of M-40 Grade, 60mm & 80mm Unipaver. Each bench consists of 2 Nos. L-shape base support in grey cement colour (thickness:80 mm, Back height:890 mm, Front height:450mm, and Base width:690mm) and 1 nos. reinforced concrete plank in red colour of size 1500mm X 400mm X 50mm, and 1 no. of reinforced concrete plank in red colour of size 1500mm X 425mm X 50mm, Overall Dimensions: Seating length of the Bench:1500 mm, Seating height of the Bench:450 mm, Total height of the Bench:890 mm, Manufactured by using M-30 grade of Concrete using vibro compaction process Reinforced suitably to promote long use and to prevent damage during handling, transportation, & erection, All parts are joined together with galvanized nuts & bolts of suitable size and all bolts are sealed after assembly, Bench top and back planks are treated with special anti-corrosive, water proof coating so as to make surfaces glossy and water proof.